Retinal tears can occur due to posterior vitreous detachments (see section on “flashes and floaters”), or other factors such as: retinal thinning disorders like “lattice degeneration” of the retina”, blunt trauma to the eye, and high nearsightedness (myopia). Retinal tears are very treatable and once treated are no longer a risk for detachment. Symptoms of a “shower of floaters” where hundreds of tiny dark spots are acutely perceived are common with retinal tears. The multitude of spots is actually blood cells that have leaked into the vitreous due to a break in tiny retinal blood vessels associated with the retinal tear. 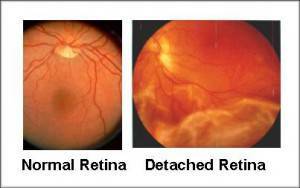 Retinal detachment is a condition where the retina separates from its connection to the deeper layers of the eye. When a detachment occurs the blood supply to the retina is compromised and the retinal cells eventually die with associated loss of vision. Depending on the location of the detachment, a person may loose only peripheral (side) vision, central vision (with “macular detachment”), or in the worst cases there can be a total loss of vision if the entire retina is detached. Early diagnosis and appropriate treatment is absolutely critical to preserving vision in cases of retinal detachment. Sudden onset of a single or a few floaters. Typically web-like in shape. Possibly associated with some peripheral light flashes, which represent the more solid vitreous component “bumping” into the retina. The flashes commonly go away after a day or so as the vitreous moves forward. Peripheral vision is generally not affected, vision generally is clear, and there is no pain felt. If you experience these symptoms you must be evaluated immediately to rule out an associated retinal tear. Retinal Break (tear or hole): Sudden onset of a “shower of floaters”. Hundreds of tiny dark spots will be seen. Flashes are common and typically persistent due to the torn retina being stimulated by the traction of the vitreous. If not associated with detachment, then peripheral vision will be normal. Only macula retinal holes are associated with loss of central vision. If you experience theses symptoms you must be evaluated immediately. Treatment involves the use of a retinal laser or a Cryo (freezing) probe to seal the break in the retina and prevent secondary retinal detachment. Retinal Detachment (RD): Loss of peripheral vision, as if a dark, blurry curtain was progressing from the side. Since most RD’s are associated with breaks in the retina, the “shower of floaters” is also a common symptom as well. If the macula is affected then central vision may be very blurry as well. This is a true ocular emergency and must be seen the same day. New surgical methods have made the treatment of retinal detachments highly successful. The key however still remains early diagnosis and treatment. LASIK and other refractive eye surgeries used to treat nearsightedness (Myopia) only reshapes the surface of the cornea. They have no effect on the back of the eye. Nearsighted eyes are at higher risk for retinal tears and detachments due to the longer axial length and secondary retinal thinning that occurs. Following LASIK, etc, these factors remain the same. Therefore, if you have had LASIK or other refractive eye surgeries, keep in mind that your retina is still just as nearsighted as before the surgery. You are still at the same risk level for retina problems and as such should have annual eye health examinations (including retinal examinations) even if your vision without glasses is 20/20!